Food. I love it. All types of food. Really. And Chemical Engineer feels the same way. So on our road trip/honeymoon, we knew there would be lots of eating and lots of different type of food (homemade by our dear friends, fast food on the road and restaurants in the towns we stayed at…). My favorite fast food restaurant was WAFFLE HOUSE. 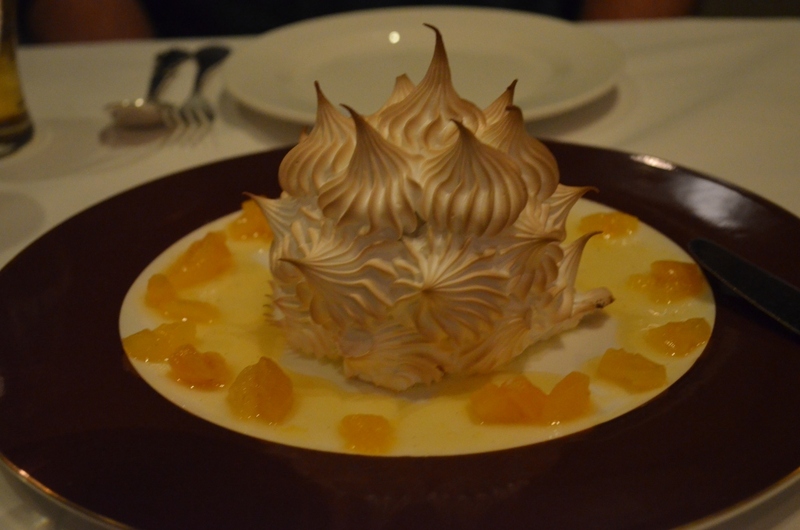 When it comes to restaurants, well while we loved all restaurants we went to, Delmenico´s in NYC stood out. 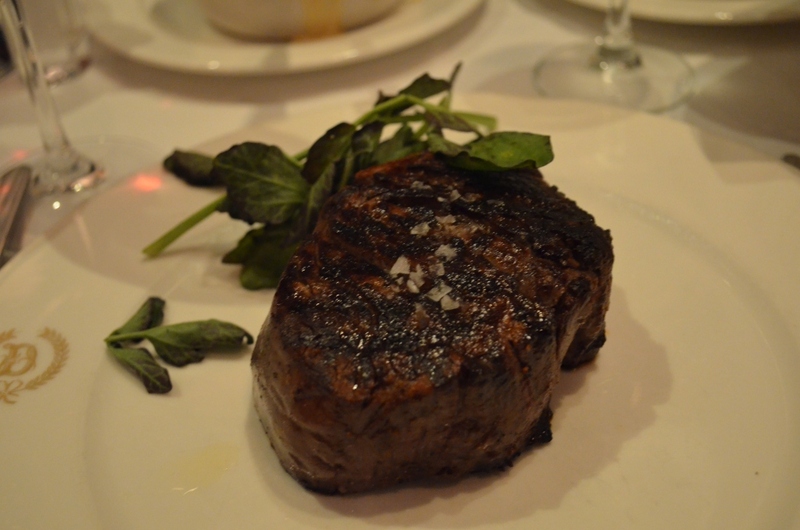 This steakhouse had everything: a NYC history (it´s considered a “classic”), an interesting atmosphere (including some people celebrating a birthday, students, a basketball player and Wall Street bankers), a funny waiter and great great great food! So tell me, what is your favorite food while on the road? Next postHappy Friday #19 – Stories, books and awards! 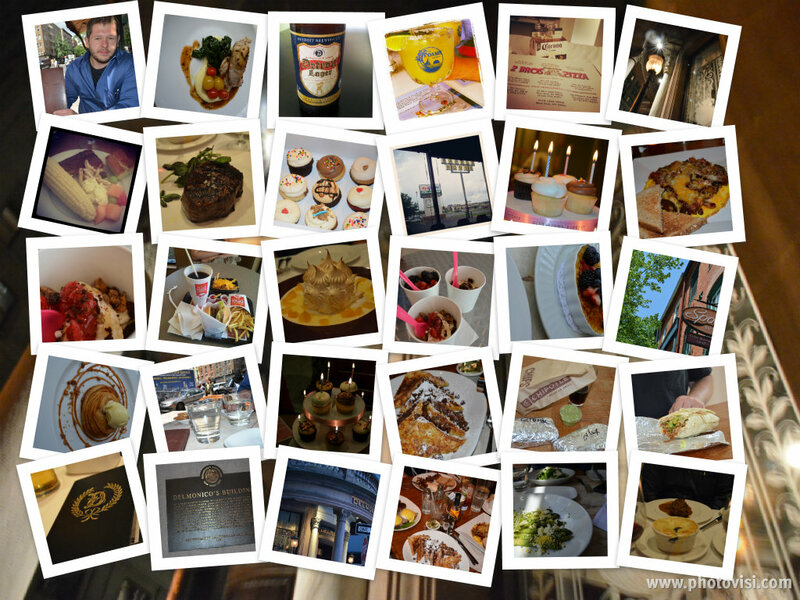 Travel is *always* about the food! Glad I’m not the only one who takes pictures of my meals, something the hubster always teases me about! When travelling I do enjoy the odd posh eat, but I love just sampling thelocal cuisine and delicacies in small, cosy eateries or street stalls. ZOMG, WAFFLE HOUSE! 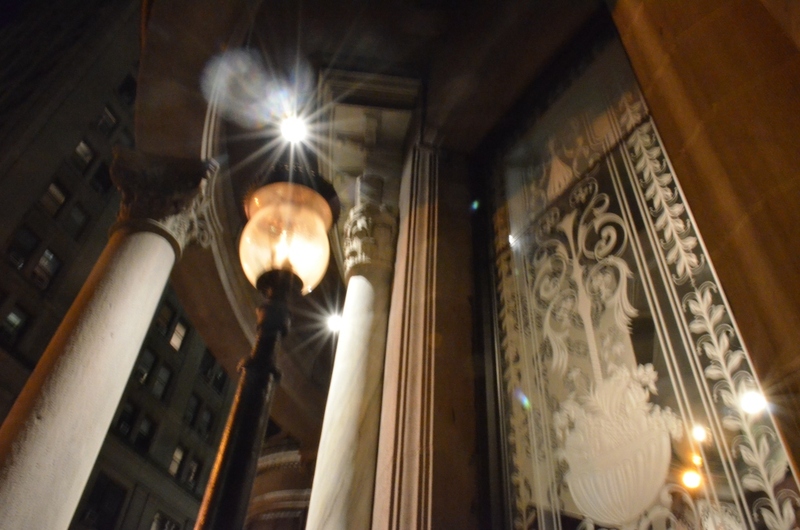 We don’t have those in the northeast, so when I first discovered them, I took pictures in every one I went to. 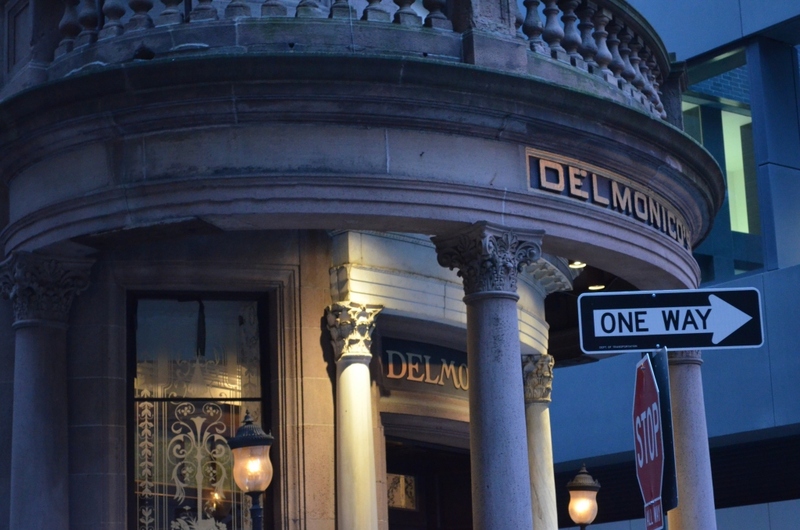 How cool that you got to go everywhere from there to Delmonico’s–WOW! Mmmmm, this post is delicious! I don’t know what it is, but vacation food always tastes so much better to me, without fail. 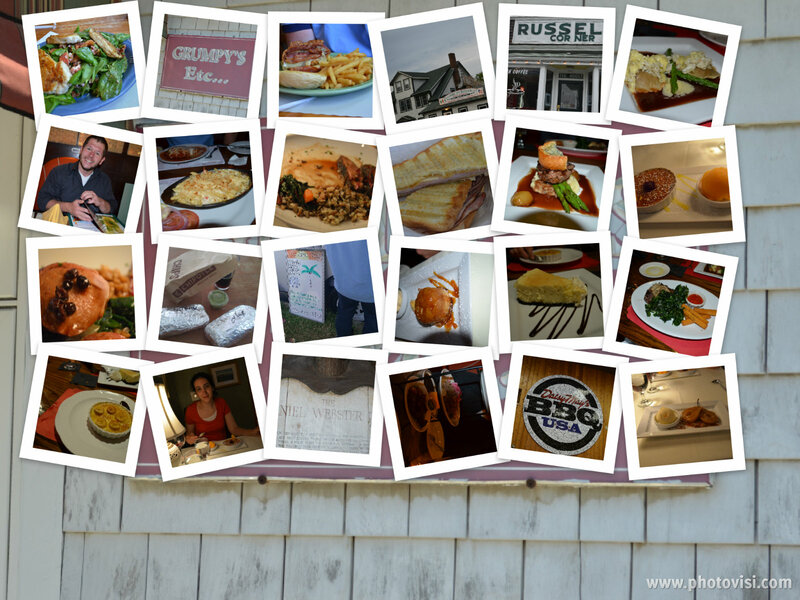 When I think back on the best meals I’ve ever eaten, 90% of them were eaten while on vacation in far-off locales. Thanks Meredith 😀 Food is just so yummy! I think when we�re on vacations, we also soak up the entire atmosphere surrounding our meals which make them all ever better! On my recent work trip to Southern California, I was glad that we were treated to food and restaurants we wouldn’t have had back East. Whenever I’m somewhere new, I much prefer sampling the local cuisine. And the food we had in SoCal was wonderful! Especially for a vegetarian. 🙂 I mentioned Nick’s at Laguna Beach on my blog a while back, but I mention it again as one of the best restaurants I’ve ever been to for service and quality of food. Oh wow, that does look amazing! Though because I don’t get to eat German stuff all year I miss it – especially during Stollen and Plaetzchen during Christmas time! On a completely unrelated note: I’m giving you the 7×7 link award which will hopefully introduce people to some of your best posts. Details here. Awww! Thanks so much for award Kat, I am thinking about posting the 7*7 link award on Tuesday 😀 It sounds like a lot of fun! It�s true that Christmas time has a special resonance in Germany too, I love the Christmas markets, enjoying a glass of hot spicy wine or just sampling on some yummy food! 😀 How often do you come to Germany? You’re more than welcome 🙂 I usually go for Christmas and summer – actually going back for a month in a little over a week! YUM! Eating at different restaurants is one of my favorite parts of traveling too. 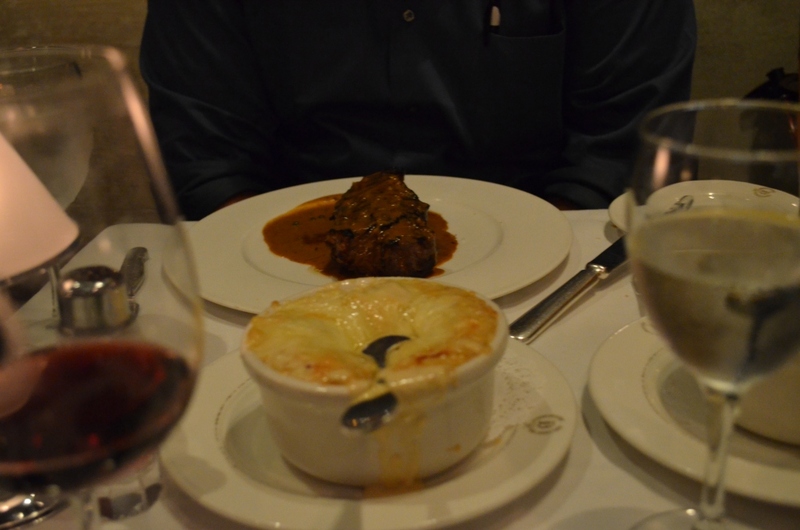 My husband and I went to San Francisco, CA and Napa (Wine Country) for our honeymoon and the food was the best part! Our trip to Scotland was wonderful, but the food was hardly memorable. Way too much pub fare and seeing ‘haggis, neeps, & tatties’ on nealry every menu was just kind of…blech. 😛 We went to Mexico the year before and had pretty amazing food just about everywhere we went. One meal that was particularly memorable was in La Paz, Mexico, and involved a lobster stuffed potato dish. So delicious! Hmmm Lobster stuffed potato dish sounds indeed delicious!!! Thanks 😀 The Waffle House is just a fun/interesting experience all around 😀 I do miss it here in Germany. I love Mexican food as well and it must be a lot of fun to try out food from restaurants which were featured on tv shows! Haha first…you made me hungry. 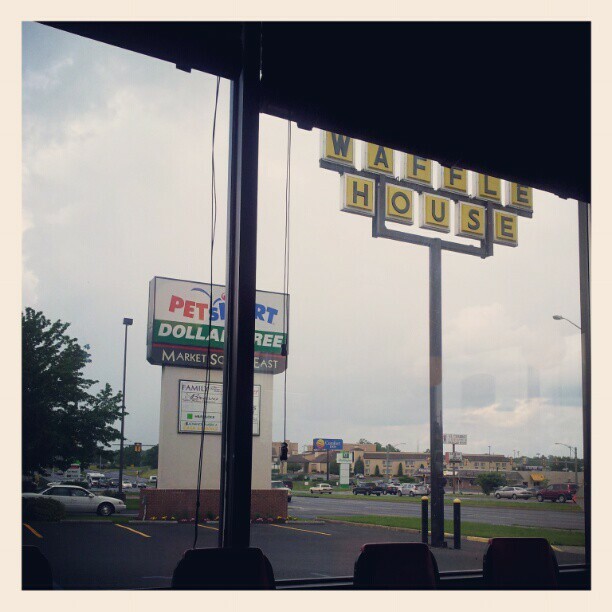 2nd I so might be stopping by Waffle House on my way home tonight (I have a friend that works night shift hehe). And now you�re totally making me jealous, did you end up going to the Waffle House? Oh did I think about it but I text my friend and he was off that night plus I had stopped by the store and had cold stuff in the car so…it was for the best not to stop by. Looking at that just makes me hungry. Looks absolutely delicious! I do love a trip to the York Hog Roast when I’m up in York. Pork, Turkey, Ham, or Beef sandwhiches and you can ask for stuffing or sauces and get a side of hot roast potatoes. Gorgeous! And I would so love to visit a waffle house or a pancake house. I could honestly have a huge stack of pancakes and maple syrup for breakfast. That would be bliss! I love road trips and it looks like yours was amazing! What a lovely honeymoon. 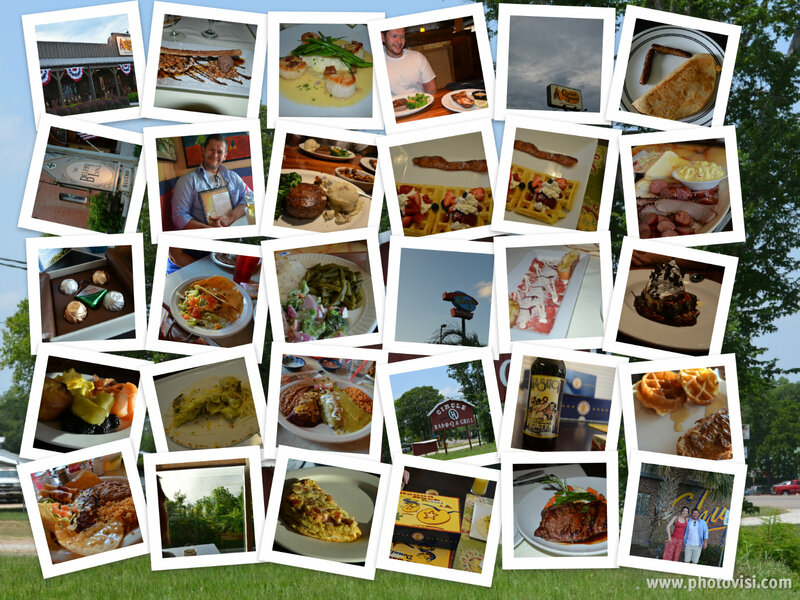 Thanks Alexa 😀 The road trip/honeymoon was indeed wonderful and the food was delicious 😀 Photovizi was quite simple to use as I was trying to find a way to share the pictures without being too overwhelming (I took a loooooooooooot of pictures :D)….